"The light music of whiskey falling into glasses made an agreeable interlude." "I wouldn’t trade places with Edmund Exley right now for all the whiskey in Ireland." Now, a word on spelling: Why do some folks spell whiskey with an "e" and others don’t? The Scots, for one, have always spelled Scotch whisky without it. "We get right to the point," one Scotch ambassador once told me. Dale Crammond, the agriculture and food counselor at the Irish embassy, said it was "the Dublin distilleries, intent on forging their uniqueness amongst other whiskies from Scotland and provincial Ireland, [who] introduced the idea of spelling their whiskey with an ‘e.’"
Now among whiskey aficionados, the spelling of the spirit can be a touchy subject. You’ve got Maker’s Mark Kentucky Straight Bourbon Whisky as well as George Dickel Rye Whisky, but both Bulleit and Wild Turkey spell their respective products whiskey. Meanwhile, an acquaintance of mine was recently chastised for not applying the term "whisk(e)y" throughout his book. Seriously? And finally, is there any truth to drink preferences based on religion, i.e., Catholic versus Protestant whiskies? It’s something I’d heard years ago—Catholics should drink Jameson and Protestants should drink Bushmill’s (but if you’ve ever had Black Bush, you won’t go back … to Jameson). In my reporting, the answer across the board was a flat-out no. Naturally these businesses want everyone drinking their product. But one industry insider said he was fairly certain the whole thing originated as a marketing ploy to either get people of one faith or the other to drink more of their brand. "What I always say is whiskey doesn’t have a religion. It’s an organic substance," said Darryl McNally, master distiller of Dubliner Irish Whiskey. "The way I look at it, in Dublin, going back to the early 1800s, John Jameson was a Presbyterian from Scotland. So if you want to really split hairs, you know, that’s not really the way you should go." 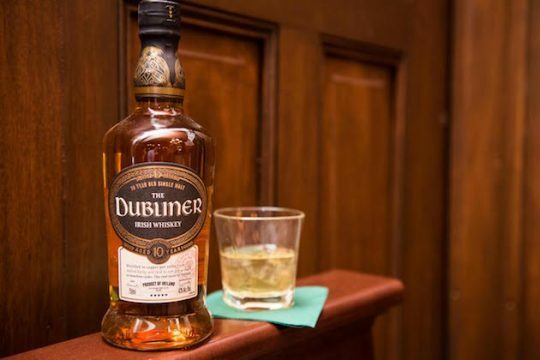 As Dubliner’s vice president of marketing Andrew Stewart advised, "Drink what you like regardless of who you are and what you are and, I think, drinking an Irish whiskey on either side of the country, north or south, it’s about sociability, friendship." Whiskey preferences based on county, however, is an entirely different story. This entry was posted in Culture and tagged Irish whiskey. Bookmark the permalink.